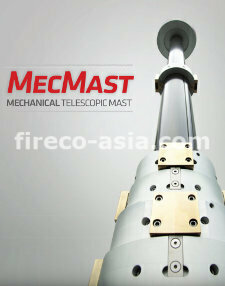 Fireco High Pressure Water Mist Kit is an essential kit to assist in extinguishing fire efficiently & effectively. It is not to replace the main extinguishing pump on Fire & rescue truck. Yet, it is an additional kit that helps to displace the oxygen that fire need, decrease of heat and thus put off the fire quicker and lesser water consumption, thanks to micro water droplets generated from Fireco High Pressure water mist kit. Sprayed in micro water droplets size 250 - 400µ: gives greater cooling surface, thermal absorption & oxygen suffocation which extinguish the fire effectively. With operating pressure ranges from 100 – 250 bars, consumption of water is lesser. GRP water tank moulded with one piece concept, no joining at the edge, better resistant to vibration force during vehicle driving. The resin used are Fire Retardant Type Comply to DIN 53438 , FIAT 50433. Built –in foam tank compartment is available. 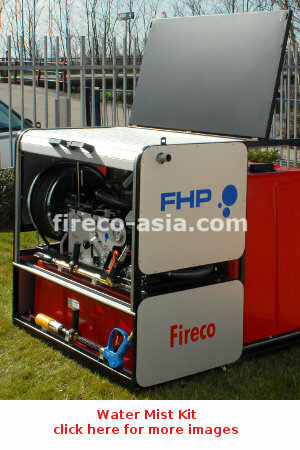 Fireco new foam mixing system (FHP Technology) provides better quality foam mixing at proportioning of 0.1 - 6%. Water suction capability from external source (eg. Water hydrant, river). Safe throwing distance: jet mode > 15m, spray mode > 12m. Better security of operator due to length of water jet, direct or nebulized increased.